"Maximum water temperature in Sydney is normally about 22 degrees Celcius"
The outside of Jervis Bay has probably the most spectacular scenery of any part of the New South Wales coastline. The only section of coast that comes close are the sections of coast north and south of Sydney Harbour. The spectacular above water geography continues below water, with high walls and huge boulders all over the place. North out of the bay the cliffs are particularly impressive, vertical walls of nearly 100 metres. 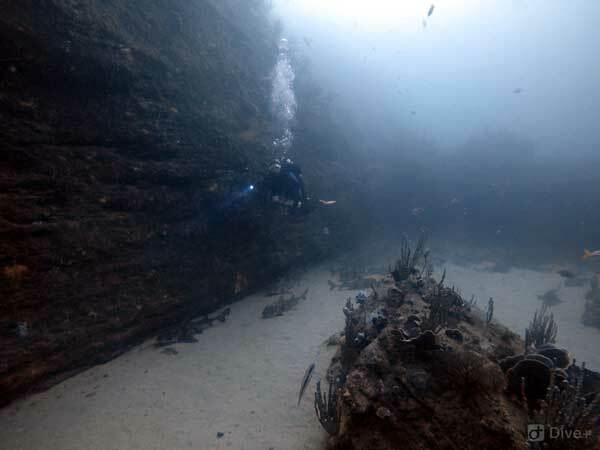 There are many brilliant dive sites, including the The Arch, possibly my favourite JB dive site. 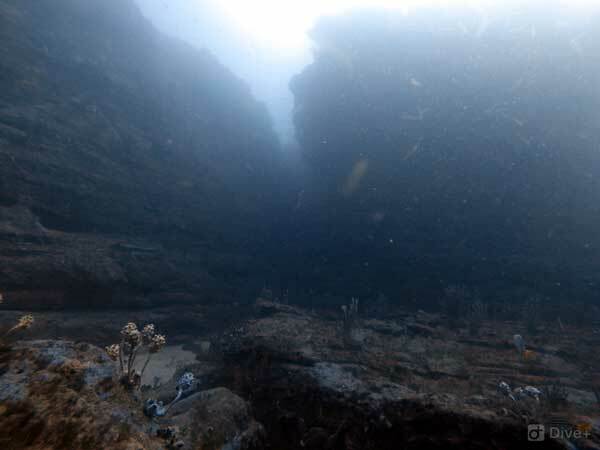 A few hundred metres to the north of The Arch is another, possibly even more dramatic dive site called The Crossroads. 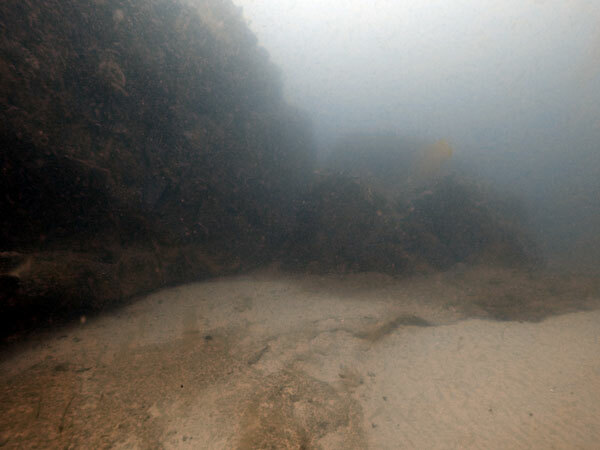 I am not sure where it got its name from as on my sole dive there I did not see anything that resembled a crossroad. Anyway, the following is a description of how to find it and the features to see. Note, this is a decompression dive as it would not be worth doing if you stayed out of deco due to the very limited bottom time you would have. The Crossroads is located at GPS (to come). As mentioned, this is a few hundred metres north of The Arch. Once at the location, run in from out to sea and you will see the bottom come up from over 40 metres to 30 and then 25 metres. Anchor in this area, making sure you put out a lot of rope in case the anchor falls off the 25 metre ledge to the 30 metre level. Once you hit the bottom you will see that there are a couple of drops as previously mentioned and the wall runs north-south. In fact, the wall apparently runs all the way back to The Arch. On my only dive here with Kelly, we did a drift to the south (we were on a charter boat) so went a bit further than you would on a normal dive. I will have to come back with our scooters and explore the site further. Anyway, the wall drops from 30 to about 39 metres and you can get over 40 metres if you swim off the wall. It is quite vertical, with some large boulders on the bottom and then sand. I think it may drop down further out to the east, I will have to check with the sounder next time I have my boat down there. As you go along you will see some cracks in the wall. These run back to the north-west (see above photographs). You can examine these as you go as there are some nice fishlife in them. 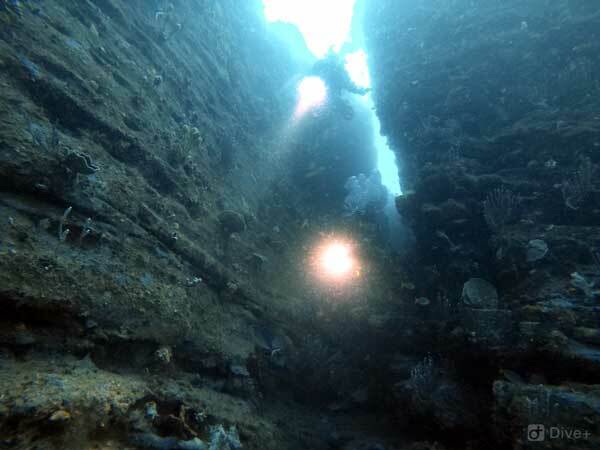 The walls and the rocks on the bottom are covered in colourful sponges, sea squirts and sea whips. The sea whips also host tiger anemones, beautiful! We also saw an eastern blue devilfish under one of the larger boulders and some in our group saw a pineapplefish. There were also lots of yellowtail around and some also saw a seal. Once you get low on air or have gone into enough deco, ascend to the top of the wall and spend a bit of time there if you can as it is also very colourful. Then shoot your SMB to the surface and do an ascent up it. We dia bout 18 metres on the deeper part of the wall and then another 5 minutes going up the wall and on top before ascending. We had a total of about eight minutes of deco to do. We were using 27% oxygen as bottom gas with a deco gas of 63%. Total dive time with 10 minutes extra safety stop. A brilliant dive I will have to do a few more times.